At the Grammar Chic blog, we often talk about the need to customize content marketing initiatives to address the specific needs or values of your customers—but of course, this invites the obvious question: How exactly does a company know what its customers want? For that matter, how can you ensure that you’re tailoring your content marketing to directly meet consumer needs? One solution is to develop buyer personas. Buyer personas are simply summaries of the individual and identifiable groups of people who might be interested in buying your products. Let’s say you’re the owner of a store that only sells big screen TVs, for example. Your buyer personas might include: People who are looking to upgrade smaller TVs to larger ones, or who have just moved into a new place and now have space for a larger screen; tech enthusiasts or entertainment junkies who always need to have the latest and greatest in TV technology; and spouses purchasing new gizmos for their better halves (wives buying for their husbands, more often than not). In the above scenario, all of those buyer personas are going to be made up mostly of adults, and probably fairly affluent ones. These are mere sketches of buyer personas, and there is really a lot more complexity to them than that. For example, consider Grammar Chic’s own buyer personas for our resume clients; many are recent college graduates, but some are also older adults who are considering a late-in-life career change. These are two very different groups with different values and needs. Gender. Some companies serve men almost exclusively, and others women; for some companies, there’s really no big gender divide at all. Where does your company fall here? Age. Targeting online content to teens is very different than targeting it to baby boomers. Profession. For B2B businesses, especially, it is helpful to think about the professions of your target customers. Finances. Are your customers wealthy, looking for a brand that carries prestige and clout—or are they looking for bargains and cost savings? Purpose. For what purpose are people buying your products? This is really at the core of your marketing. Interests and hobbies. 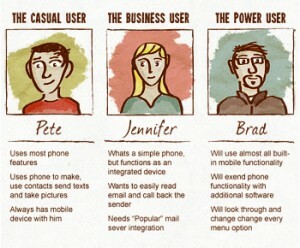 How do your buyer personas spend their free time? If they watch a lot of TV, for instance, then TV-themed blogs or memes might make sense for your content marketing. Shopping habits. What else do your customers buy? Where else do they shop? What ultimately influences their buying decisions? Once you’ve crafted buyer personas, there is much that you can do with them. Really, we recommend having them on hand at all times, referencing them each time you sit down to develop new content. Use them to ensure you are addressing specific people, rather than making your content too general; that you are using your content to address particular challenges or problems; that you’re showcasing products in the proper price range; and that you’re engaging, entertaining, and informing your readers. A buyer persona, by the way, is never set in stone; you should revisit and revise them as needed. For more information about any of this, we do invite you to call us for a free content marketing consultation. Check us out on the Web at www.grammarchic.net, or call 804-831-7444.